Tapered thread bowden coupling PC4-M6, PC4-M10 by krtektm is licensed under the Creative Commons - Attribution - Share Alike license. The christmas present for the community! 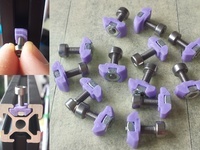 Printed replacement for bowden coupling PC4-M6 or PC4-M10 (compatible with heatsink or another printer part). A little filing with a 4mm drill bit may be necessary on the printed part. I already ruined 3 pieces of metal coupling with blue top bought on AliExpress so they're not holding the bowden anymore. 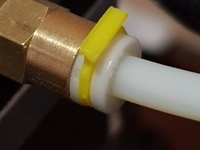 The tapered thread coupling gave me an idea to recreate it to bowden coupling, which will be still usable after a lot of opening the coupling. 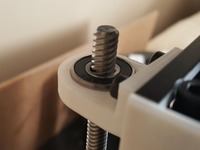 I used self-centering tapered thread Z-axis coupling V2.5 (http://www.thingiverse.com/thing:602481/#files) to create a coupling for bowden (PC4-M6 + PC4-M10). 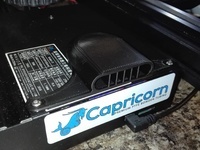 Added photo of the very first functional print. I had to clean the inner hole with 4mm drill bit. Then I fastened the nut with wrench and the bowden is locked on it's place perfectly. Say thanks by giving krtektm a tip and help them continue to share amazing Things with the Thingiverse community. Say thanks and help krtektm continue to share amazing Things with the Thingiverse community. You'll need a PayPal account to tip krtektm. Click the button below and you will be redirected to PayPal. Once the payment is complete, you'll be brought back to Thingiverse.